What do you do when your classmate, friend, and neighbor turns out to have been responsible for the 2013 Boston Marathon bombings that shook the world? The unforgettable closing event of a year spent exploring the question “Where is Cambridge From?” was a screening and conversation with the filmmakers of “Jahar,” a short film made by two high school friends of Dzhokhar “Jahar” Tsarnaev. Sponsored in collaboration with CCTV, the final 2017 History Café provided an evening of thoughtful reflection about the process of healing after a tragedy strikes, all too close to home. 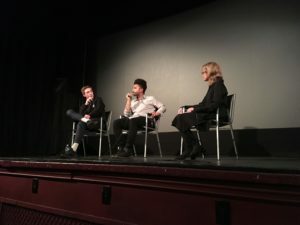 “History is what is happening today.” said Marieke Van Damme, Executive Director of the Cambridge Historical Society, when introducing the screening of “Jahar,” at the Brattle Theater on November 13. 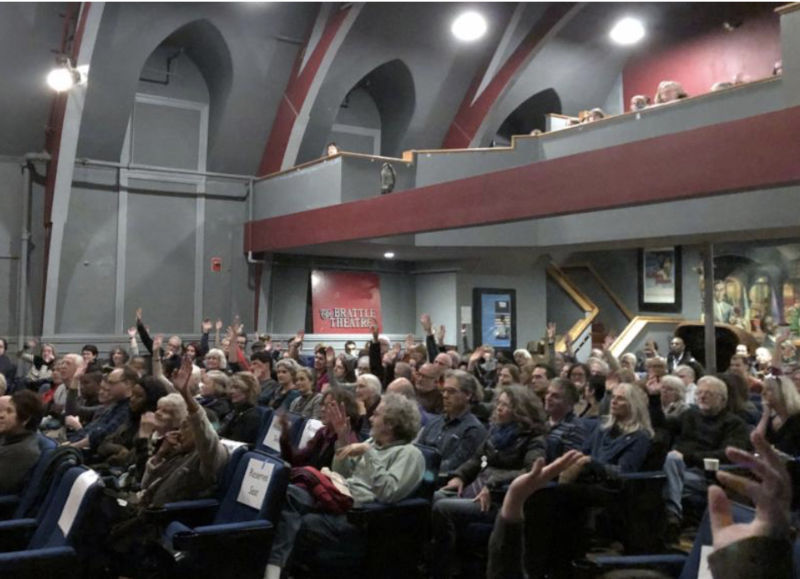 Presented as part of the Cambridge Historical Society’s History Café series, the screening and discussion with filmmakers Henry Hayes and Zolan Kanno-Youngs, and moderator Robin Young, journalist and co-host of WBUR’s “Here and Now,” focused on the filmmakers’ friendship with Jahar before – and their experience after – the 2013 Boston Marathon Bombing. “Jahar” is the phonetic pronunciation of Dzhokhar, the younger of the two Tsarnaev brothers who perpetrated the bombing. As we see in the film, he was a popular student at Cambridge Rindge and Latin High School, graduating in the class of 2011. 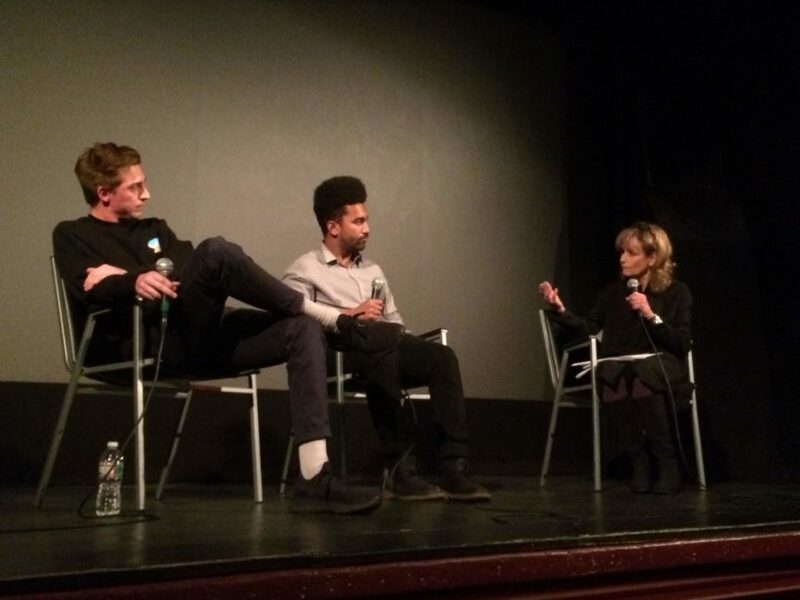 The filmmakers explained in the panel discussion after the 12-minute film that they set out not to explain or probe the “why” behind what happened, but to show Jahar as a person and a friend before the bombing, and then how his friends tried to cope in the aftermath of learning of this heinous deed. The short drama premiered at the 2016 Tribeca Film Festival. “Cambridge,” an expanded screenplay, received the Showtime Tony Cox Feature Screenplay Award at the 2018 Nantucket Film Festival. As a long-time Cantabridgian, I knew that attending this event would be powerful and disturbing. Like the filmmakers and many others in our city, I was traumatized beyond the original horror of the death, injury, and suffering to so many, by the fact that the perpetrators were from Cambridge. Unlike the filmmakers and their many classmates who knew and were friends with Dzhokhar, I did not know him personally. But, like the filmmakers, I felt the “wound to the city” and to everything we believe about being an open and welcoming place committed to equity, honoring diversity, and social justice.